Cities looking for sustainable economic growth might consider investing in a seemingly unlikely source: urban beekeeping. Contrary to what one might expect, urban bees survive better, produce more honey, and are healthier than rural bees. Furthermore, urban bees have a winter survival rate of 62.5 percent, compared to just 40 percent for their rural counterparts. Urban bees also produce, on average, 26.25 pounds of honey in their first year, while the yield for rural bees is only 16.75 pounds. In light of these facts, cities should capitalize on and invest in urban beekeeping. 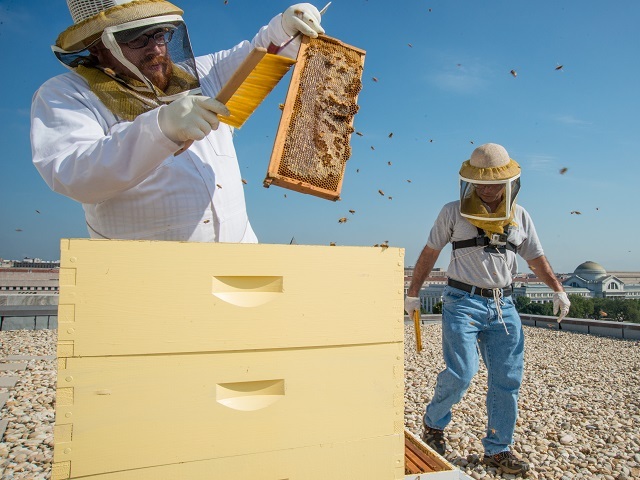 Cultivating beehives in an urban context will not only help cities develop economically, but will also have a positive impact on bee health and—by extension—the agricultural community. In short, beehives located in cities produce healthier and more productive bees. The reason is that urban bees have access to greater biodiversity, resulting in a more varied diet and stronger immune systems. Although it might seem natural that hives would thrive best in rural environments, modern monoculture farming exposes bees to less diverse plants types and more pesticides. Bee health is particularly important today because over the past decade, bee populations have been drastically declining due to colony collapse disorder (CCD). CCD has no identified cause, yet has contributed significantly to shrinking global bee populations every year by 30 percent since 2006. Neonicotinoids, a class of insecticides, have been linked to bee disappearance, and their use is considered to be one of the possible drivers of CCD. However, urban bees are not exposed to this harsh chemical, which means they are less likely to die off from CCD, especially considering that cities are generally healthier homes for bees. In the future, agriculture may turn to renting urban bees to pollinate their crops, granting urban beekeepers tremendous economic opportunity. Bees and other animal pollinators contribute to 35 percent of global food production, making bees essential for agriculture and plant life. And, as bee populations decline, the need for secondary sources of pollen for agricultural production grows. Thus, demand for renting out honeybees is increasing. In California, for example, bee population fallout became so dire for the agricultural sector that in 2014, Los Angeles changed the law, allowing urban beekeeping to reinvigorate local bee populations. While urban beekeeping will not replace large-scale apiculture, it may help support areas that are most affected by diminishing bee populations. Because some of the world’s largest honey exporters are developing countries such as Ukraine, Turkey, and Mexico, urban apiculture wields extraordinary possibility for growth. And, as a business, apiculture has immediate impacts on regional development. Furthermore, since most of the labor is executed by the bees, beekeeping is low-tech and neither a time nor labor-intensive task. Residents can easily start a few beehives as a secondary source of income by selling honey as a cash crop or even as an export crop. Additionally, honey has the advantage over perishable crops in that it never spoils, allowing producers to stock honey for as long as they need. Finally, honey also has medicinal purposes, cultural value, and nutritional density, making it a useful source of carbohydrates for food insecure areas. Many nonprofit organizations have already recognized the value of beekeeping for developing countries, serving as models that regional and local governments should follow, as public investment could have an even bigger impact. One organization, Bees Without Borders, helps people in Fiji, Uganda, Haiti, and Kenya use beekeeping for additional income, and works on initiatives in these countries with the belief that apiculture can be a tool for sustainable communities. Their work in Uganda, for example, tripled the number of beekeepers who have access to the honey market in 2014, doubling average sales per beekeeper by the end of the project. Similarly, Bees Abroad is utilizing beekeeping as a way to reduce poverty. One of their initiatives in Southern Cameroon works to establish permanent local honey markets, and in 2012, they achieved a 49 percent increase in honey sales. Finally, Bee World Project supports rural and agricultural beekeeping in developing countries, and is currently working with women’s groups in the Dominican Republic to triple the price they receive per kilogram of honey. Most work to promote beekeeping as a tool for community development has taken place in a rural context. However, urban beekeeping is recently yielding some success in major cities like Los Angeles, New York, London, and Paris, mainly as resources for restaurants and hotels. As a whole, urban beekeeping clearly has benefits for diverse sets of individuals. However, unsubstantiated fears about bees and swarms in densely populated areas hold urban beekeeping back. Founder of NYC Beekeeper’s Association and Bees Without Borders Andrew Coté argues that bees do not threaten urban populations, and notes that bee swarms occur when bees are the most subdued. Educating policymakers and citizens will help quell fears about the danger of bees in cities. Urban apiculture is not only a great economic opportunity for developing cities, but it’s a necessary investment for both bee health and agricultural stability. Supporting responsible development programs and laws can help cultivate urban beekeeping as the backbone of a sustainable urban economy.